Colonel Alfred William Sheen, C.B.E., M.S., F.R.C.S., 1869-1945. The death of Provost Sheen has deprived the Society of one of its most useful and influential members those who were colleagues of his on the Society's Council will remember his sound judgment and wise counsel in their deliberations. He was born in 1869, the son of a well-known Cardiff practitioner, educated at University College, Cardiff, and Guy's Hospital, where he qualified in 1892, with honours, in the M.B., B.S. of London, subsequently proceeding to the M.D. and M.S. degrees and F.R.C.S. 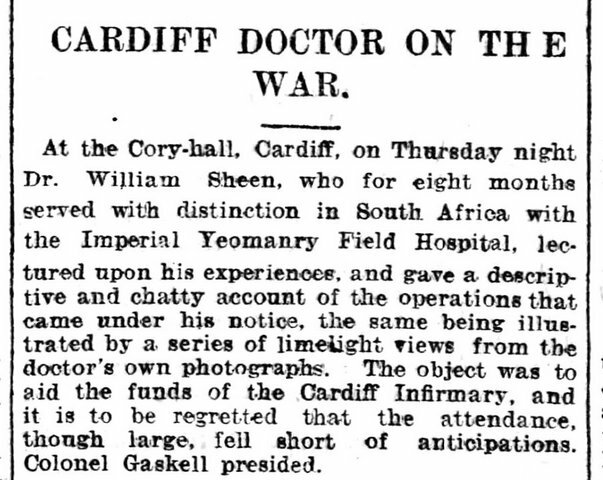 Settling in Cardiff as a consulting surgeon he became a member of the Honorary Surgical Staff of the Cardiff Infirmary in 1895, which position he had held ever since. He served throughout the South African War with the Imperial Yeomanry Field Hospital, and was mentioned in despatches. In the 1914-1918 war he formed and commanded the Welsh Hospital at Netley, which was afterwards established in India as the 34th (Welsh) General Hospital, where he remained until 1919. For his services he was made C.B.E. in 1918. 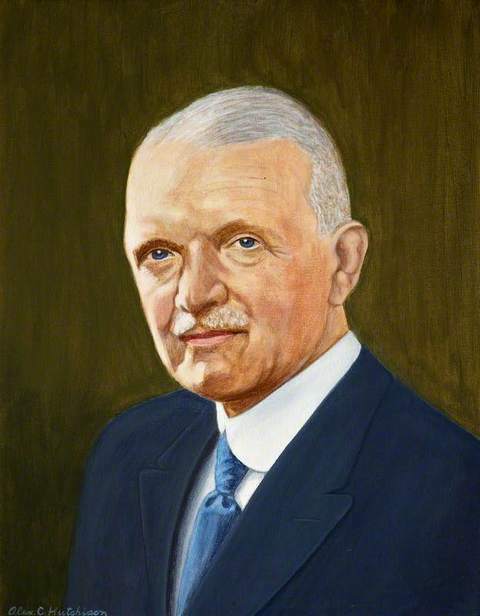 In 1921 he became Professor of Surgery in the Welsh National School of Medicine, and in 1935 was appointed Provost of the School. Among his many activities he was County Director of Voluntary Aid in Glamorgan, Past President of the Hunterian Society, and President of the Section of Surgery at the Annual Meeting of the British Medical Association in Cardiff in 1928. 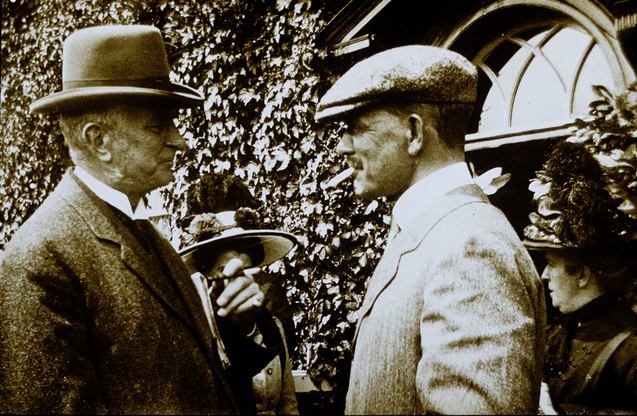 Provost Sheen joined the Society in 1899, became a member of the Council in 1906, and served as President in 1911-1912. 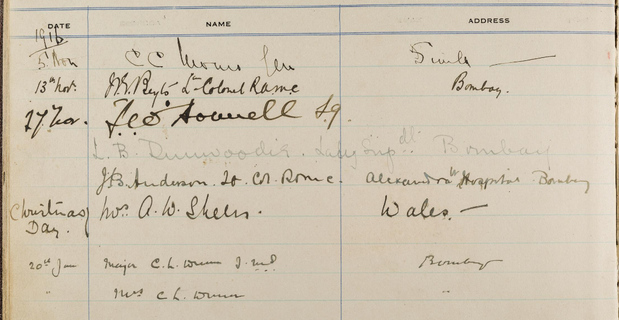 For his Presidential Address he chose as the subject The History of the Cardiff Naturalists' Society, with some possibilities for its Future," he also delivered an address on the same subject at the Diamond Jubilee of the Society on November 3rd, 1927 the latter was published in Vol. 60. We are indebted to the Secretary of the Cardiff Royal Infirmary, Mr. F. Dagnall, for much of the foregoing information, including the Obituary Notice in the British Medical Journal," 21.iv.1945, and for a copy of the Resolution of regret passed by the Board of Management of the Infirmary on March 28th of that year. 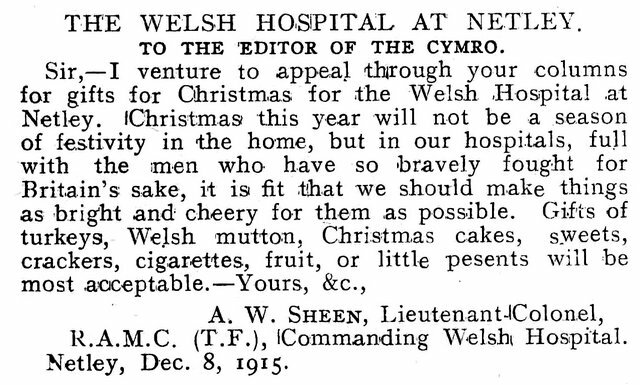 The Council regrets to report that Mr. William Sheen, who had so ably edited the Society's Transactions for ten years, felt it necessary to resign that post, chiefly on account of his leaving Cardiff to command the Welsh Hospital. There is a lot more information about the Royal Victoria Hospital to give the name of the entire hospital on The Royal Victoria Hospital and Military Cemetery at Netley site and the Queen Alexandra's Royal Army Nursing Corps websites. 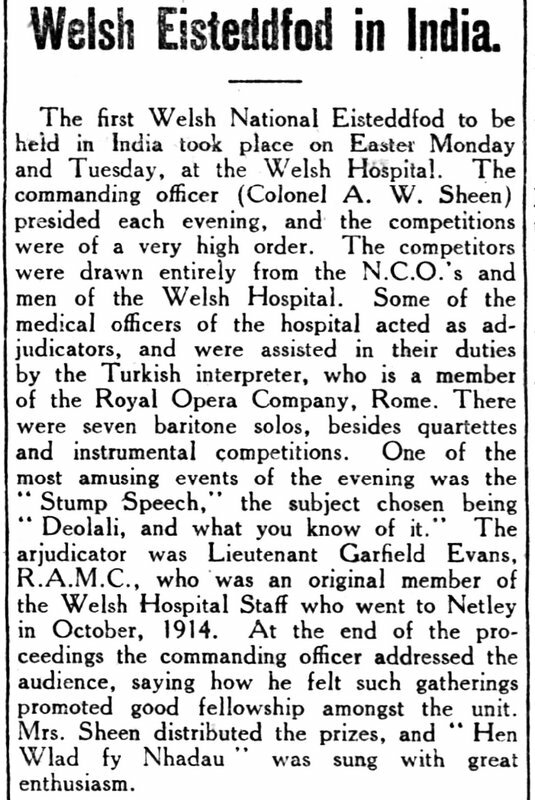 The Amman Valley Chronicle and East Carmarthen News 24th May 1917, Welsh Eisteddfod in India. 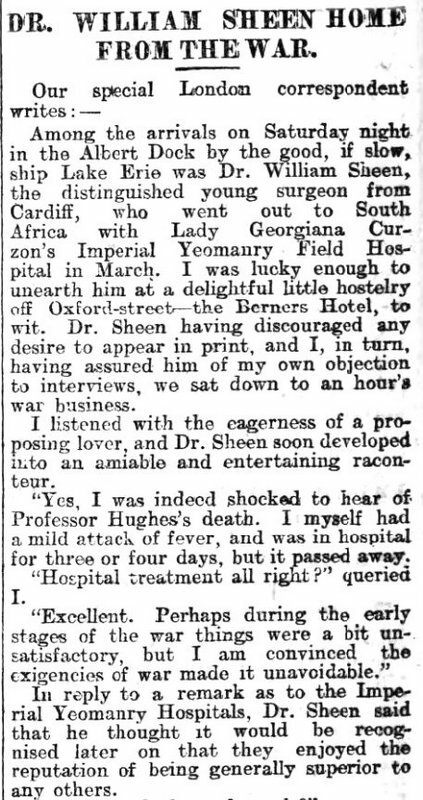 Although Sheen stood down as professor of surgery in 1935, a year after the School's normal retirement age for academic staff, he continued as Provost and, at the outbreak of the war, he resumed as professor of surgery while Lambert Rogers, d'Abreu and others went on active service. ... The manner of his demise was characteristic of his indomitable spirit. He had struggled from his home to the medical school, an exhausting journey of some four miles, through the heaviest snow on record, in order to keep an appointment. The effort proved too much for his heart, he collapsed in his office and, despite the best efforts of his Infirmary colleagues, he died a month later.